Ninety-two-year-old Pearl Thompson was a student at Shaw University in 1942 when she attempted to check out a book from the Olivia Raney Library in Raleigh, North Carolina. Her school, which is an HBCU, didn’t carry the book she needed for a history class so she visited the local library. According to her daughter, Deborah Thompson, Pearl was denied a library card because she was black, so instead, she was sent to the building's basement to read the book. “I expected to go in and get a book,” Pearl told News & Observer. 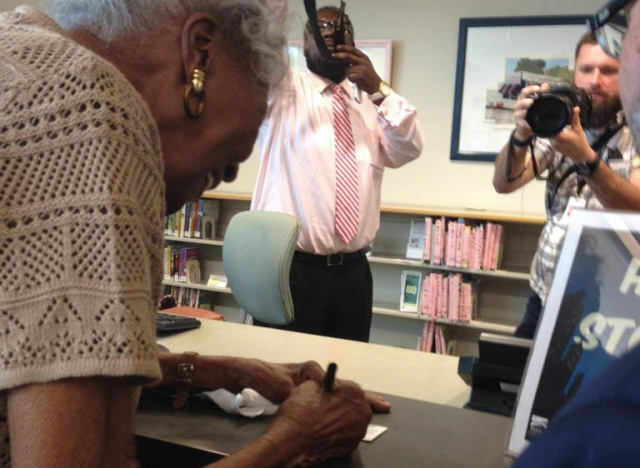 Seventy-three years later, Pearl returned to Raleigh with her daughter and granddaughter and finally got her library card. Pearl Thompson signs the back of her library card. “She was fighting good health but she was determined to make this trip,” Deborah told HuffPost. She said Pearl is currently battling kidney disease and suffers from heart issues -- but she wouldn't let that stop her. The Olivia Raney Library was the city’s first public library and later became a part of the larger Wake County Public Library system. In the 1960's, it merged with Richard B. Harrison Library -- a library Deborah said Pearl helped to launch -- which only served blacks at the time. 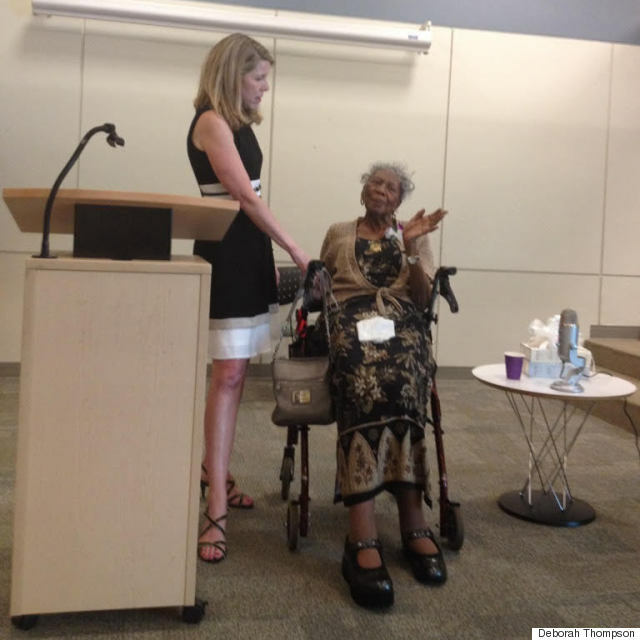 The Olivia Raney Library, which is now closed, serves as a local history library and the administration at Cameron Village Library, which opened right after Olivia Raney Library closed, held a ceremony in Pearl's honor last week. "We all felt that the presentation of Mrs. Thompson's library card needed to be honored with a ceremony and we also wanted the opportunity to rectify a mistake of the past,” Ann Burlingame, deputy director of Wake County Public Libraries, told The Huffington Post on Tuesday. After college, Pearl, who has always been an advocate for education, went on to become a teacher in Raleigh for nearly fifty years. “I was determined that when I became a teacher every child would have an opportunity to learn to read,” Pearl said at the ceremony. “A little boy [had] Down’s syndrome and they said he would never learn to read. And I taught him to read. Even to the point he wrote books himself." Thompson moved to Ohio with her husband after 12 years as a teacher in Raleigh, and she now lives in Cincinnati where she taught for 37 years. Decades after her days in college, she said she doesn't hold a grudge against the library and their poor treatment. Pearl Thompson with deputy director Ann Burlingame.